With water levels at a record low in California, vigilantes are using social media to shame their neighbours into saving more water. Despite calls for massive reduction in water use and the threat of fines for those who waste water, there are still Californians washing their cars and watering their lawns. "Glad to see #droughtshaming is already a thing! Adding these jerks in San Mateo," tweeted Fiyin Adewale with a picture of a house and three sprinklers hydrating a modest lawn. Celebrities' lush lawns are a particular target online. "Nothing is worse than talentless liberal celebrities preaching to the masses but not leading by example. #WakeUpAmerica #DroughtShaming" wrote one woman in reference to Sean Penn's garden greenery. Singer Jennifer Lopez, reality TV star Kim Kardashian and Academy-Award winner Barbra Streisand were among the celebrities drought shamed in a New York Post article, which posted aerial photos of their gardens. The LA Times argued in their defence, however, "it's hard [to] know how big of water wasters they are. And it's unclear when the aerial photographs were taken." Still, you don't have to be a Kardashian to be drought shamed. According to a poll by the Public Policy Institute of California, 66% of Californians believe that their neighbours are not doing enough to save water. Those who have had enough are no longer staying quiet. 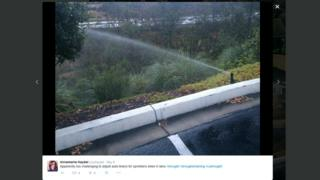 "Apparently too challenging to adjust auto timers for sprinklers when it rains #drought #droughtshaming #cadrought," Californian resident Annemarie Haydel tweeted with a picture of the offending curb-side sprinkler. It seems few are safe from scrutiny - even schools. That photo was uploaded via the Drought Shame app, which was recently launched by Dan Estes, a commercial real estate broker living in the southern California area of Santa Monica. "I'd noticed several instances of people wasting water, like crazy, dumb stuff - water leaking everywhere from sprinklers or car dealerships washing cars every day," Estes told BBC Trending. "I didn't really know how to report it to the city or water depot so this was the best I could come up with." The app is simple: it lets you take a picture, locates where you are when taking the photo and then creates a database of incidents. "Tweeting a picture of it makes the person feel better but I wanted to design an app that could help contribute actual data on these incidents," Estes says. The app has only been downloaded about a hundred times, but Estes is hoping to add video and collaborate with city officials, some of whom also have apps. The creation of independent and publicly held data is important as California is the only western state that does not make its water data public: information was only released about cities with exceptionally high per capita water usage for the first time last year. There's no data on whether drought shaming really does save water. But with no solution in sight, some residents are willing to try anything. Next story: Would it have been different if the Waco bikers were black?